At first glance, it seems like a bizarre idea for an animated movie. There is a hero programmed to be a cuddly health care assistant and shaped like the Pillsbury doughboy. His teenaged handler is obsessed with robotics and technology, focused on its good uses, but naïve to its dark side. They live in San Fransokyo, a near-future mash-up of San Francisco and Tokyo — within a mash-up of anime and comic book moviemaking. The comic series that inspired this was a short, obscure Marvel series in 2008-9. Leave it to Walt Disney Animation Studios and its story trust and animation team, the best in the world, to convert these disparate parts into Big Hero 6, a 90-minute superhero story with tremendous technological features. The movie, which premieres in 3D on November 7, has its creators raving in superlatives. That’s saying something, considering these men and women most recently delivered pictures such as Frozen, Monsters Inc., The Lion King, Bolt, Tangled, Winnie the Pooh, Wreck-It Ralph and others. Innovation & Tech Today was privileged to attend the Domestic Long Lead Press Day for Big Hero 6, during which the principal creators broke down the movie’s primary components —direction, story and script, visual effects, character animation, and production design. We experienced the thrill of walking through a building loaded with animation cels and photos from Steamboat Willie to Frozen, and the 51 animated pictures in between. We also immersed in the magic created by Walt Disney and his nephew, Roy, beginning when they opened the studio in the Los Angeles suburb of Burbank in 1923. After a creative lull, the place is rocking again, thanks to Disney’s 2006 purchase of its biggest threat, Pixar, and the arrival of Pixar’s dynamic duo, John Lasseter and Ed Catmull. But this was not a nostalgic journey. Instead, we took in the inner workings and developmental secrets of a movie in which the very latest in animation moviemaking and technology was utilized in human and robotic characters, flight and pursuit scenes, and devices (the microbots are an amazing creation). The movie borrowed an approach familiar to anime fans, one that fits the Disney mold: the use of technology as a path to a better future. Conversely, Western movies tend to depict technology as a villain, or something that leads us down a destructive, dystopian path until we either right ourselves – or not. “You really see the anime influence in our action scenes, which are really killer and pretty pushed,” said co-director Don Hall, whose lifelong obsession with superhero comics led to his discovery of the Big Hero 6 Marvel series in 2010 in an obscure New York comic book store, which led to the movie. As we took in a general session followed by the five breakouts, it became clear the Disney crew was thrilled with its latest groundbreaking effort — a term that seems redundant in this studio. Big Hero 6 matches Conli’s description. 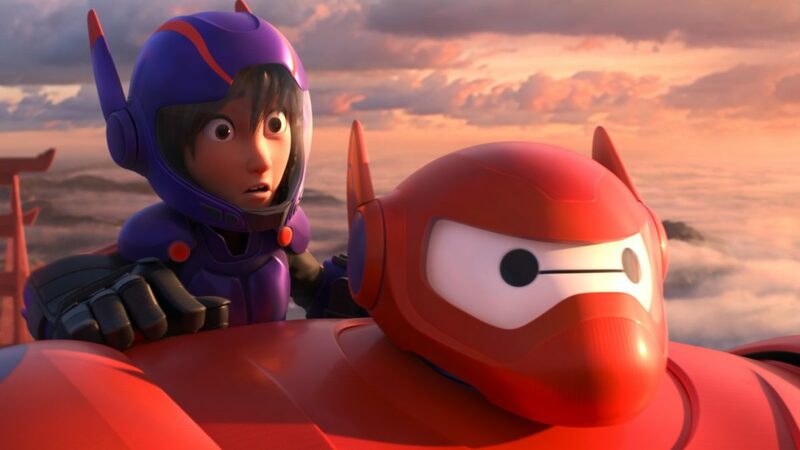 The action-packed comedy adventure concerns robotics prodigy Hiro Hamada (voiced by Ryan Potter), who learns to harness his genius, thanks to his brilliant brother Tadashi and their like minded friends: adrenaline junkie Go Go Tamago, neatnik Wasabi, chemistry whiz Honey Lemon, and fanboy Fred. When a devastating turn of events catapults them into the midst of a dangerous plot unfolding in the streets of San Fransokyo, Hiro turns to his closest companion — a personal healthcare robot named Baymax (voice of Scott Adsit), who is programmed to diagnose and/or deliver care for 10,000 health situations. They transform the group into high-tech heroes determined to solve the mystery (Go Go Tamago’s power lies in her extreme sports skills, for example, her “vehicle” a fun hybrid of a skateboard, snowboard and in-line skates). Once in place with their distinct, colorful superhero costumes, the band sets out to solve the diabolical mystery. A lot of things are pushed and celebrated in Big Hero 6, which reflects the extent to which the Disney team ventured. It is an approach filled with innovation and flawless execution. When you create wardrobe palettes of more than 100 outfits for each character, and generate tens of thousands of posters, sketches, drawings and paintings (about 3,000 of which were on display) to match a script that Robert Baird estimated he and longtime writing partner Daniel Gerson rewrote more than 40 times, the approach becomes even more impressive. • Big Hero 6 features seven distinct action sequences – the most of any Disney animated picture. • There are 15 main characters and 701 total unique characters – the most for any Disney animated film in both cases. (Disney’s average is three main characters and another half-dozen minor characters). • A total of 1,324 animation cycles were built, more than 600 for each gender. This led to 632,124 cycles retargeted for character variants – total movements for all characters, in all frames. The team used its proprietary denizen software, along with Maya Animation Software, to control specific parts of the characters’ bodies from drawings and sculptures. • The detail is so refined that a single 11-second shot, in which Hiro tries to sneak Baymax into the house past his aunt, took three to four weeks to animate, and involved 1,600 shots. • A total of 40 effects animators were used on the film – yet another Disney record. • In one of the movie’s most thrilling scenes, involving microbots that Hiro invented and were then stolen for evil purposes, more than 20 million microbots give chase, employing properties that … well, you’ll see when the movie comes out. • More than 1,000 drawings were generated for each story sequence, of which there were 30. Among other things, they depicted technologies such as the microbots, robots with human properties (Baymax), aerial wind turbines, supersonic vehicles, hands equipped with defibrillators, database projections and holograms, and robotic upgrades with hand scanners. To further develop and find Baymax’s look and movement, Parrish and his team of five animation supervisors and 85 animators looked at real robots, soft robots, movie robots, toddlers, babies and animals. In the film’s second nod to biomimicry (the microbot-ant connection being the other), they found their perfect movement source in penguins, “especially babies, with their curiosity. They waddle and don’t use their arms much. That was our ‘A-ha!’ moment,” Parrish said. (Biomimicry might be today’s hot buzzword in green technology, but Disney was deploying it cinematically and famously in 1946, in Song of the South, and in 1964, through the animatronics in Mary Poppins). The movie’s greatest character transformation comes when the soft, awkward, ultra-caring Baymax becomes a superhero. In a particular flight scene, visual effects experts replicated shock diamonds – the crystals that form when leaking plane fuel (every plane leaks a little fuel) hits a pulse of heat generated by the plane, reigniting the escaped fuel. As far as anyone knew, that is unprecedented. While Felix was talking, Character Design Supervisor Jin Kim was quickly scratching out a sketch of Hiro on a tablet and projecting it onto a widescreen. You’ve gotta love the way Disney conducts its press days. The final group of characters are Hiro and his eclectic band of friends-turned-superheroes. They make the entire movie go, doing so in a way that producer Conli finds particularly appealing and valuable (and which we’ll refrain from describing further until the movie releases). “The thing I’m proudest about is that we’re celebrating really smart people,” he said. As well as celebrating a really smart film, made with and co-starring refined technology. Big Hero 6 premieres November 7. To read about Feast, the Patrick Osborne-directed Disney short that will accompany the movie, go to www.innotechtoday.net.